2017-10-02 topics > No.36 Visit our Facebook page! In celebration of World Wetlands Day 2017 (celebrated internationally each year on 2 February), we hosted Winter Eco Tour 2017 for local residents on Saturday, 4th February 2017. 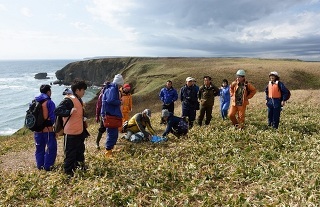 The event took place at Lake Takkobu in Kushiro Wetland and Mr. Hisashi Shinsho, the Chair of the KIWC Technical Committee, provided commentary during the field tour. 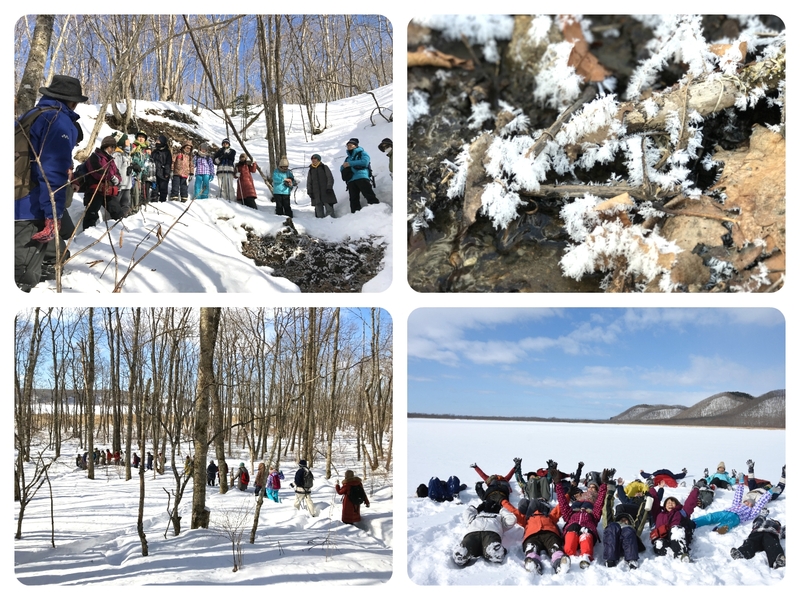 We walked up to the source of stream by the lake and observed water spring out of the ground and frost flowers (delicate ice structures) bloom around the source. 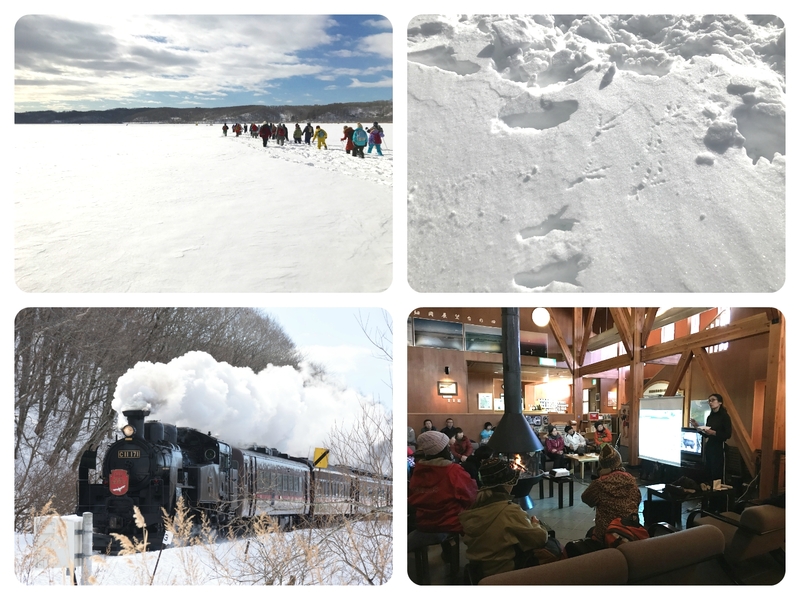 We then walked across the snow-covered frozen lake and found animal tracks in the snow and snow ripples. In the afternoon, KIWC gave a presentation on Wetlands for Disaster Risk Reduction, which is the theme for this year’s World Wetlands day, and explained about how Kushiro Wetland played an important role in flood management and disaster risk reduction during the massive typhoon that struck Hokkaido in August 2016. We also did quiz completion regarding Kushiro Wetland In the bus on our way to Lake Takkobu and the participants had a great time taking part in it. KIWC hosts JICA Country-focused Training on the Anzali Wetland Ecological Management Project Phase II as part of an ecological management project organized by the Japan International Cooperation Agency (JICA) for Iran’s Anzali Wetland. The training was provided in various parts of Japan from 9 October to 22 October, 2016. The course was attended by 7 high government officials from Iran who are involved in wetland ecological management and basin control. 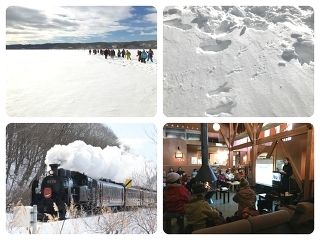 From 12 October to 15 October, the training was provided in the Kushiro region. The participants visited the Kushiro Wetland and neighboring facilities. They learned about a nature restoration project being implemented for the wetland and canoe tour operation on the wetland. A discussion and exchange session was held on 15 October to roundup the training in Kushiro with the attendance of KIWC staff, local residents and local government officials involved in the conservation of the wetland. The attendees engaged in lively discussions with the participants. Finally, the KIWC Secretary General wrapped up the session with some general comments, highlighting hopes for the development of exchanges and collaboration among people involved in the conservation of the Kushiro Wetland and the Anzali Wetland in the future. On 20 October 2016, the KIWC Technical Committee held an on-site study meeting to examine case examples under its 2016 – 2018 research theme of “the wise use of wetlands”. Committee members visited Kenbokki Island, an uninhabited island in Hamanaka Town under the guidance of Mr. Urita, Vice President of NPO Kiritappu National Trust and Ms. Kouchi, member of KIWC Technical Committee and staff at Kiritappu Wetland Centre. 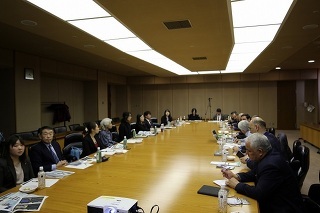 Committee members then had a lively exchange of views about eco-tourism at Kenbokki Island. On 16 October 2016, a public participation survey on a restored river environment was conducted in the Kushiro River section where the meander was restored to a natural stream section (approximately 5.5 kilometers from Kayanuma to Sugawara). Participants canoed down the river, observing riverbank vegetation, landscapes, animals, plants and other elements of the surrounding environment along the way. They stopped at a sandbank to examine their size and geological formations. After completion of the survey, participants summarized their findings and results. They shared a great deal of information, such as it was their first time to see white-tailed eagle, many fallen trees along the river after a massive typhoon tore through the eastern Hokkaido in August, and the difference in water colour between the two streams at their confluence. The event was originally planned for 17 September, but was postponed to 16 October 24 due to the typhoon.